Indians wave national flags as they wait for the release of an Indian air force pilot by Pakistani authorities, in Jammu, India, March 1, 2019. The sparring between India and Pakistan last month threatened to spiral out of control and only interventions by U.S. officials, including National Security Adviser John Bolton, headed off a bigger conflict, five sources familiar with the events said. 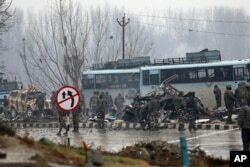 FILE - Indian paramilitary soldiers stand by the wreckage of a bus after an explosion in Pampore, Indian-controlled Kashmir, Feb. 14, 2019. FILE - Indian National Security Adviser Ajit Doval, right, talks with Chinese State Councillor Yang Jiechi before their delegation-level meeting in New Delhi, India, Dec. 22, 2017. That evening, Indian National Security Adviser Ajit Doval spoke over a secure line to the head of Pakistan’s Inter Services Intelligence (ISI), Asim Munir, to tell him India was not going to back off its new campaign of “counterterrorism” even after the pilot’s capture, an Indian government source and a Western diplomat with knowledge of the conversations told Reuters in New Delhi. FILE - U.S. President Donald Trump accompanied by U.S. Secretary of State Mike Pompeo speaks at a news conference, following talks with North Korean leader Kim Jong Un in Hanoi, Vietnam, Feb. 28, 2019. “Secretary Pompeo led diplomatic engagement directly, and that played an essential role in de-escalating the tensions between the two sides,” State Department deputy spokesperson Robert Palladino said in a briefing in Washington March 5. FILE - An image taken from video released by Pakistan's military, shows what Pakistan claims to be an Indian pilot who was captured after his plane was shot down by Pakistan's Air Force in the Pakistani-controlled part of Kashmir.